Top four trends driving Injection Molded Plastic Market over 2016-2023: U.S. to remain a prominent revenue contributor « Global Market Insights, Inc. In the recent years, injection molded plastic market has been influenced by a plethora of trends. It is noteworthy to mention that some of these trends mentioned below will not have a prominent impact on solely injection molded plastic industry, but on the entire plastic manufacturing sector. The onset of automation has created a path-breaking influence on practically all the industries worldwide. Robotics has long since been a disrupting trend in the manufacturing sector, and if surveys are to be believed, its impact across injection molded plastic industry is slated to be immense. Heavily deployed in myriad manufacturing processes, automated tools and robots have transformed the dynamics of manufacturing sector. Automated robots are quick, accurate, agile, and adaptable, which ultimately translates into efficient production. As per a 2014 survey, manufacturers predicted that the United States will be responsible for more than 455 of their production by 2019. The year 2014 also depicted that 20% of the top executives working companies that are a part of the billion-dollar fraternity intended to come back to the U.S. from China. More than 22% of other such executives have declared that they would do the same in a few years. A humongous figure exceeding 50% have declared interest in on-shoring. The U.S. plastics sector accounts for the employment of almost 900,000 employees in the region, which will be a key factor impelling the regional injection molded plastic market. In fact, the country houses around 16,000 plastic manufacturing facilities. 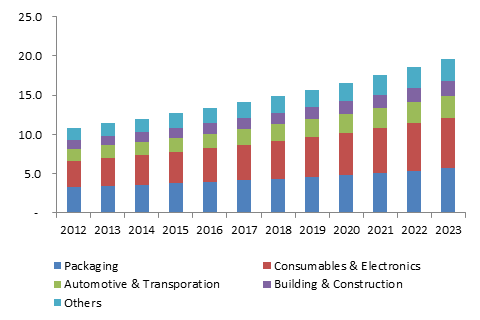 North America injection molded plastic industry, dominated by the U.S., is slated to depict a CAGR of 4.8% over 2016-2023 demand, supported by the expansion of the F&B packaging and construction sectors. In 2012, plastic shipments accounted for more than USD 370 billion in sales. The same year had actually recorded a valuation of more than USD 12 billion. Experts have rightly stated that injection molding can be qualified as one of the greatest technologies ever conceptualized, that has transformed the outlook of the global plastic sector. The advent of 3D printing has cast a momentary gloom on the growth spectrum of injection molded plastic market, especially since the former is reputed for the production of finished prototypes, however, industry players have been concentrating on bringing forth newer techniques to develop a range of plastic models that may be more flexible and affordable. Keeping abreast of the latest trends, companies operating in injection molded plastic industry have also begun to concentrate on the development of bio-based plastics. Also, they ultimately intend to reduce the dependency factor on crude oil subject to strict environmental legislations enforced by regulatory bodies, which may lead to the generation of lucrative investment opportunities, thereby creating a favorable growth path for injection molded plastic market. This entry was posted in Polymers and Advanced Materials and tagged ABS, HDPE, Injection Molded Plastic, Injection Molded Plastic Market, Injection Molded Plastic Market Analysis, Injection Molded Plastic Market Forecast, Injection Molded Plastic Market Growth, Injection Molded Plastic Market PDF, Injection Molded Plastic Market Report, Injection Molded Plastic Market Share, Injection Molded Plastic Market Size, Injection Molded Plastic Market Trends, Injection Molded Plastic Market Update, Polypropylene, Polystyrene.